Just got a '99 Mazda 626 with under 40,000 miles, all original, in excellent condition. I know they are original miles because I have known the original owner since I was born. Dad got the car new and has only driven it in town to board meetings and other events where he went without Mom. We have had the car about 3 weeks, also only driving it in town to Doctors appointments and grocery store runs. The other day, it died. The first thing that happened is that all the electrical quit working. The lights went dark, the radio went silent, the AC blower slowed WAY down and was blowing hot air, the electric windows would not roll up or down, the turn signals would not blink - nor would the emergency flashers. The engine started idling a little roughly. After a few minutes of this, the engine died, and we had to push it into a parking lot. I had my truck and picked up Kelly (my wife) and took her to the Dr appointment. After that, we went back to the car. It started up and most of the electrical worked, but not the lights. I was able to drive it home, but it died as I pulled it into the driveway. Fortunately, the car had enough momentum to coast into the driveway. The next morning, the car started again and had the same symptoms - windows & radio working, but not the lights. I believe that if this were the battery, it would not start again after dying. I am thinking it is the charging system & HOPING it is NOT the ECM (Electronic Control Module - the "computer"). My vote is that the alternator is dead. I perused this forum and cannot find any of the shop manuals to download (a common benefit of joining other forums - Silverado/Sierra, Honda Civic, Honda Shadow Motorcycles, - all vehicles I currently own besides this Mazda). Maybe I have missed it. If it is on this site, or available elsewhere, please point me in the right direction. I also did not find any "How to change the alternator" information among the tutorials on this forum. If I missed it, please point me in the right direction. I have an education in electronics troubleshooting & work for your friendly, neighborhood, global telecommunications and entertainment 3-letter giant doing electronic troubleshooting. I have rebuilt a number of car and truck engines, along with the brakes on every vehicle I have ever known and multiple alternators, fuel pumps, distributors, etc. I am no stranger to wrenching and have almost every tool one could possibly need for all the above mentioned tasks. I just need some guidelines for replacing the alternator - and some good sources of a replacement alternator or alternator kit would also be appreciated. WOW! aleekat, THANK YOU!!! That should have what I need. If you scanned those, you spent most of a lifetime running each page through the scanner. I truly appreciate you. PS: Did you, or anyone you know, ever "take the last train to Clarksville?" Apparently, there was a redesign of the vehicle that happened in 1998, effective in the 1999 model. The 1998 manual(s) refer to two different engine types (FS & KL), but I cannot find any information regarding which engine is in my car. I am downloading the 2001 manual(s) to see if there is any difference in the troubleshooting and/or R&R (Removal and Replacement) process. Apparently, the 2001 also has FS & KL engine types. I am wondering how to tell which engine type is in my vehicle? I found the diagram about where the engine ID is located, I'm just not sure if I can get where I can see it. Sounds good to me. I am picking up a new alternator - the book calls it a "generator" but the ordering said it was an "alternator." Hopefully, not a problem. I'm getting the new alternator for 123.53, after tax and the returned core charge. I pick it up this morning and hope I can have it done today and/or tomorrow. The alternator belt (serpentine? has ridges running the entire length of the belt) was VERY loose. I touched it, and it fell off. When I reached up from underneath (the engine compartment) to pull it out of the car, this pulley came with it. It APPEARS that it fits around the crankshaft pulley. But, everything I see for the "crankshaft" pulley shows the timing belt pulley with ridges running the width of the belt, not the length (like the alternator pulley). Note the shiny path inside the pulley. It matches the shiny path outside the crankshaft pulley. I am thinking a little JB Weld, a hammer, and then reinstall the belt. BUT, I PROBABLY should replace the pulley. So, I am confused. I hung the pulley in the belt and lowered the pulley down to where it was attached. It slips onto the pulley where it was installed, but there is a BUNCH of play in it, and lots of room between the 2 pulleys. There is a pretty good gap between the inside diameter of the pulley pictured above and the outside diameter of the pulley where it appears to attach. I also found what appears to be torn up rubber spewed around the inside of the engine compartment near the normal position of the pulley. I am thinking that there is some kind of seal that goes between the inner pulley and the outer pulley (pictured above) that holds the outer pulley in place. BUT, finding a picture with the pulley I have in my hand is impossible, except in the drawings, and that does not show an exploded view of the pulley. I am VERY open to suggestions and guidance. HOLY SCHNITTERS!!! It appears to be the Engine Crankshaft Pulley with Harmonic Balancer, and it AIN'T CHEAP!!! Is there no way to repair the pulley? MUST it be replaced as a whole unit? 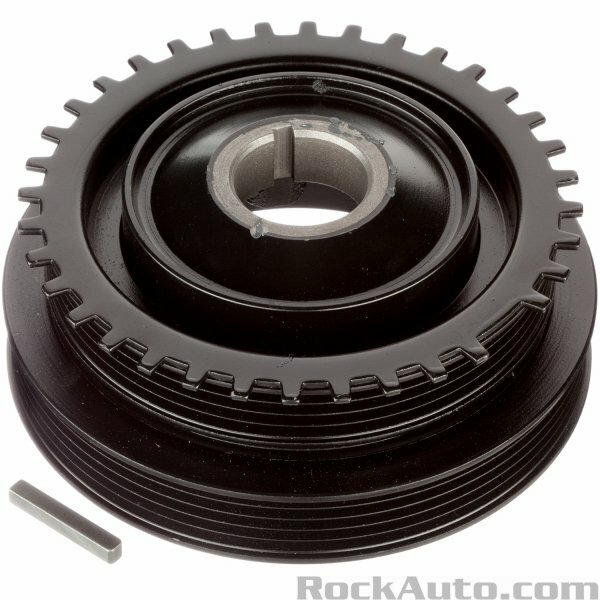 Rockauto.com from $46 to $140. Not repairable. Replace your timing belt while you are there. It appears that there is a Harmonic Balancer Repair Sleeve that will prevent me from having to remove the timing belt pulley. With under 40,000 miles on this thing, and the belts and hoses all look brand new, I am not sure I want to do the full timing belt routine. No, no repair sleeve. The ones I found are metal, and that requires a rubber insert. Looks like RockAuto it is. You really need to google the sleeve thing. It will not repair a harmonic balancer that has come apart. It's to prevent oil leaks. The rubber you saw is what keeps the 2 pulleys together. It's one piece. 5% is not bad, albeit less than shipping. Still, I get a discount and they see that I heard about them through this forum, so it is a win-win. Looks like I also need a "Harmonic Balancer Puller" to get the old one off I am looking at the Dorman kit, and it does not make much sense to me how it works since the pulley bolts on from the crankshaft bolt in the middle. But, maybe there are a couple of threaded holes in the pulley to which the puller can attach? A puller is probably the ONE tool I have never used and still do not own. But, the one from RockAuto is cheaper than Harbor Frieight!!! There are threaded holes to which the puller can attach, right? Does the balancer pull out the engine seal when removed? If #1 is "Yes," do I need to replace the seal because it will be damaged? Or should it come out relatively unscathed? Do I need a balancer install tool in addition to the puller? Can the puller be worked in reverse to press the balancer back onto the shaft? I don't want to hammer the balancer onto the shaft, if I can help it! & I am sure I have other questions, but am thinking more about lunch at the moment. 4. no. if you clean up the shaft and some oil. you can get it to slide on. Don't forget the wooddruft key. The link is an interesting read, albeit for a 4 banger & mine is a 6. BUT, the concepts are all the same. I have a 99 Civic with about 170k miles on the original timing belt that I will change first. Like I said, the belts & hoses look like they are brand new. 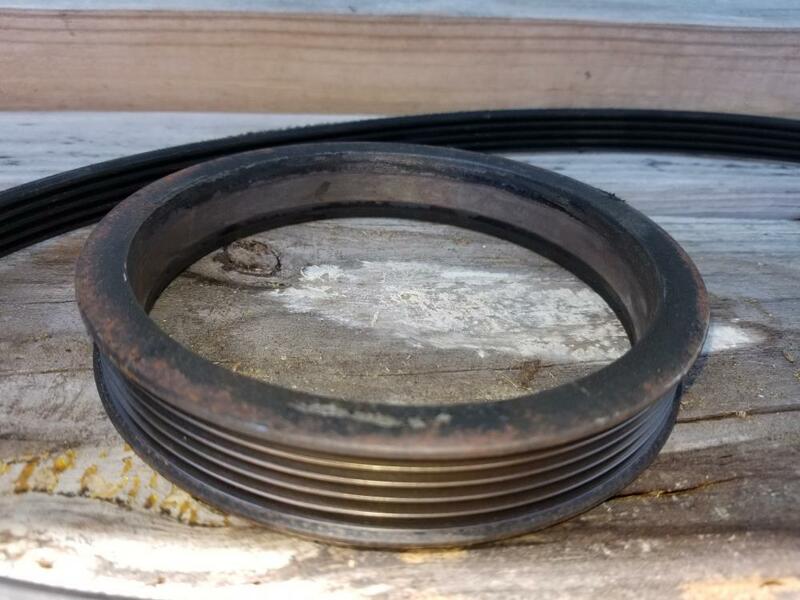 The serpentine belt that runs the alternator & AC compressor do not have a single crack in them and they look like they were installed yesterday. So, I am not worried about the Mazda timing belt. Dad kept pretty good care of the car and barely put 2000 miles on it each year. It was their 2nd car (just replaced it with an Altima to go with their Maxima) and, although driven regularly, never went out of town and never was taken when both Mom & Dad went somewhere together. I am returning the alternator as I do not believe that it is malfunctioning in any way. If you were local, I'd buy you a beer or a quart of synthetic oil. I really appreciate you and the time you have taken to keep me on the right path to success. Thank you! I have placed my order & will update when the product arrives!